Cusco Zero-1 Coilover Kits share the same size shock absober as the fully adjustable unit of the Zero-2 and provide excellent ride comfort! The Cusco Zero-1 Coilover Kits are easy to set up and gives you full control over ride height, that will provide you with an amazing feel. 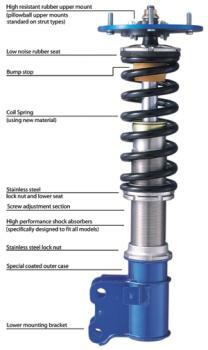 Ride height adjustable coilover kit with pre-set dampening rate. Wish to eliminate bumper steer and under steer. Want a lower ride height quality at a reasonably priced system.